Glogirly finally found her way home from the Cat Writers' Association conference. She was quick to unpack the Muse Medallion awards she received for best color photography series and best black & white series. I question the sense of awarding HER the medallions for photos that clearly featured ME. ...and a couple of Waffles. Those medallions are awfully big and heavy too. Not exactly cat-friendly. I can barely bat them around the townhouse. And considering she STOLE my mouse for her so-called Halloween costume, I have nothing to bat around here except a certain orange ...ok, not such a bad idea after all. 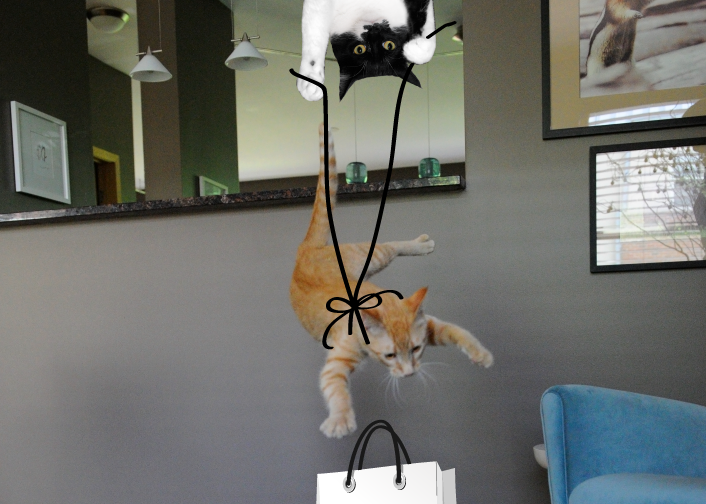 Glogirly had a great time hanging with all the cat ladies. There were lots of laughs, lots of cat ears and even MORE awards. 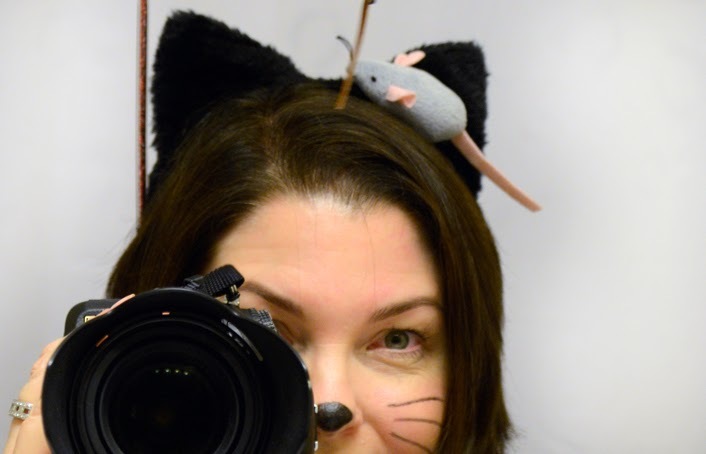 Big congratulations to our friends Angie Bailey of Catladyland, JaneA Kelley from Paws & Effect and Cat Wisdom 101's Layla Morgan Wilde for their Muse Medallion wins. And a special congratulations to Deb Barnes of Zee & Zoey for winning Friskies' Writer of the Year Award! Glogirly's favorite part was rooming with Maxwell, FaRADay & Allie's mother from A Tonk's Tail. They stayed up late, painting their nails, talking about boyz and comparing wand toy stories. 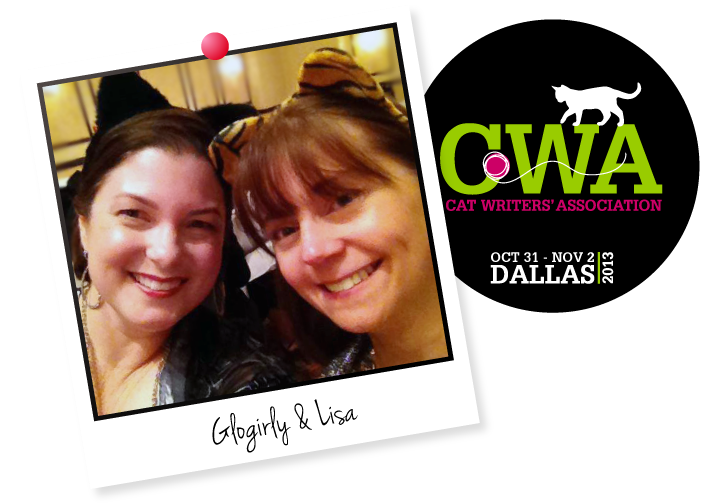 Another exciting part of the conference was the unveiling of the new CWA logo that Glogirly had a hand in designing. She did the t-shirts and conference program covers too. So Glogirly claims to have some special kitty swag for us in a bag that has yet to be unpacked. Waffles and I are hopeful that she'll crack it open later sometime today. If not, we may have to resort to a joint covert operation. Thank you so much to our friends & readers for so kindly visiting us while the girl's been away. We hope to catch up on our visiting and commenting very soon! I know how talented Glogirly is when it comes to designing. I am hoping to have a good Christmas to let her spruce up Pricilla's blog like she did mine. So Waffles - she must have packed more than shoes and underwear. It seems there were ears and a mouse too. That must have been some conference! More pics please. Wah, the t-shirts are all gone and I didn't get one. It sounds like a lot of fun! Too bad I couldn't have gone... It's just up the street in Dallas not far from Austin! And congratulations on the awards! My human said she had a great time hanging out with you and Lisa! I want to know why this organization isn't called "Humans-Who-Write-About-Cats Association," since as far as I can see, no actual cats are members. It sounds like they ha a lot of fun! ConCats to all of the winners. Katie, are you and Waffles thinking of cooperating?????? You and Waffles working as a team?!?!? Wow this must be some cool swag!!! Well done on all your awards Katie (O and the rest of your staff!) Great to see you and waffles working together! It sounds like you had a wonderful time!! Congrats again to Glogirly on her awards - it is really an honor to receive them. Congrats to ALL the winners! We're glad everybody had a great time! Will Katie REALLY cooperate with Waffles after all the mischief he got into while Glogirly was gone?!?!?!? We hope you guys get that swag soon. Katie, you really deserve it for everything you had to put up with while Glogirly was gone. Congrats to Glogirly, but really without you none of this would be happening so where is your award Katie? It should at least earn you some extra treats. Congratulations, Glogirly! The photographs are very beautiful and the honors well deserved. That's some devious looking caper happening. What are Waffles and Katie doing? I told you already but CONGRATULATIONS AGAIN for your WELL-DESERVED awards!!!! Enjoyed keeping up with Gloman while you were away. LOVE THE NEW LOGO! So....can we substitute your logo for the ugly one on the sidebar of my blog? I need the "professional" membership one....let me know! Concats! Those medallions are gorgeous & well-deserved too! I know Katie & Waffles were both glad to see you back! We are too! Concats on those cool medallions! Sounds like a lot of fun way had by all. Concatulations, Glogirly! We love ALL your photos and are especially happy that you won for the beautiful pics selected. Hooray! Daddy Kiril is still sad he could not attend as he felt there was much he could learn about. LOL on the picture of Katie lowering down Waffles on the rope! Congrats on your medallions! That's great news! - Crepes & Alana. Congratulations to Glogirly on her award winning photos. We think they are outstanding too - especially the close up of you beautiful Katie. he he - love the oone of Waffles dangling in the air on this bloggy too. Sounds like everyone had a great time. Concats to all the medallion winners. She has some swag you don't know about?? Get on it and check it out! Welcome home to Glogirly, we is sure you both missed her furry much! Maxwell: Waff, uhh, dude... seriously? You're really gonna trust Katie like that? You're a braver mancat that I am. FaRADaY: Oh, and mommy sent me back to say she had THE BESTEST TIME EVAH rooming with your human, Waffles! Concats on the medals and you really should give Katie her smousey back. That last image is great. 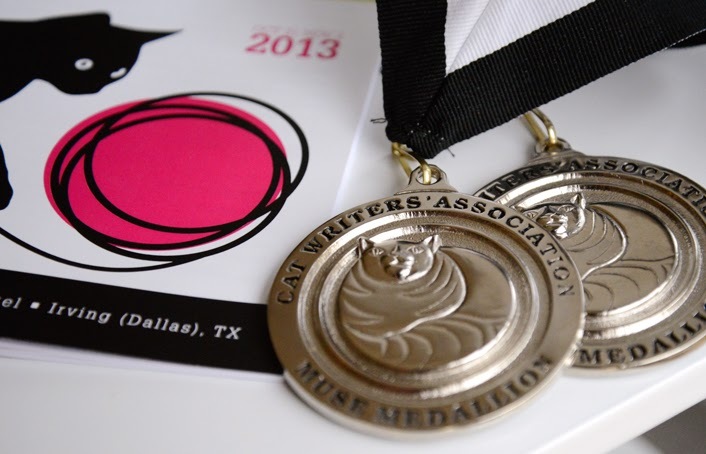 Concatulations on the Muse Medallion awards! Sounds like the humans had a grreat time at the conference !